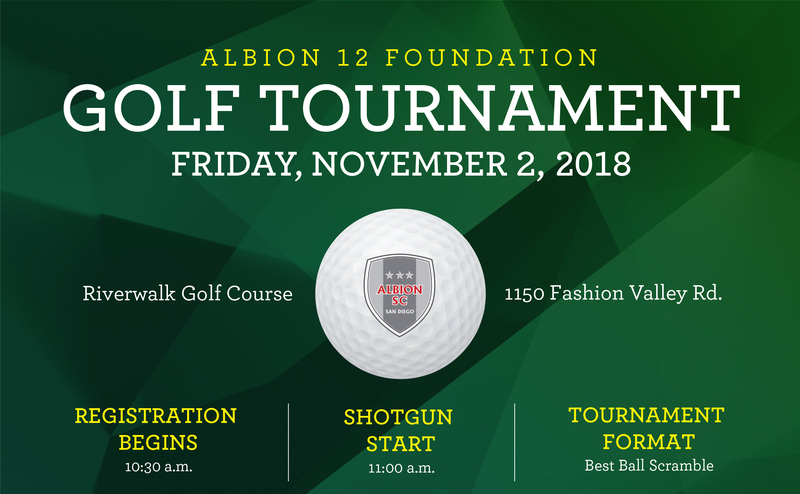 We are pleased to invite you to attend the Albion 12 Foundation Golf Tournament 2018. The Albion 12 Foundation annual Golf Tournament has become a much anticipated event of the season! It is 100% business oriented and the perfect opportunity for people from our community to network and initiate new business opportunities. Moreover this event is hosted by the Albion 12 Foundation, a 501(c)(3) non-profit foundation, dedicated solely to the funding of Youth Soccer Scholarships, Life Programming, and Facility Development/Operations for Albion SC. The Tournament will take place on Friday, November 2nd, at Riverwalk Golf Course. This is an excellent way to support the Foundation while having a brilliant day on the course supporting our youth players, followed by a closing reception. Additionally, following the day on the course, the Albion SC $10,000 Raffle winner will be drawn! For Sponsorship Opportunities please contact Ashley Goodrich at agoodrich@albionsoccer.org.